In our global economy and political spectrum, two worlds seem to exist. We are either productive or fruitless in the gross domestic product and leaning to the right or the left in political stance. 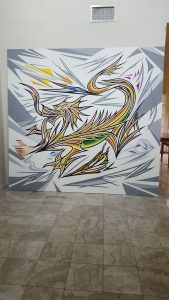 Austin artist, Chamel Raghu, highlights these issues in his latest creation, “The Rebirth of Asia,” an oil painting that stands nine feet tall, showing a sharp and pointed mythological dragon. He recently displayed the painting at an Austin Art Studio Exhibition, and in the interim, it rests in his home on the outskirts of Austin. Raghu has a love for classical music, as at the time of the interview, he was watching a Youtube of a violin concerto he heard at the Austin Symphony Orchestra concert the night before. “The second movement of this violin concerto is meant to be relaxing, right?” Raghu asked in regards to Pope Benedict possibly falling asleep during the performance on the Youtube of choice. In previous coverage, there was speculation that he was a recluse, having some health issues, and mysteriously disappearing, but those concerns can be put to rest. Raghu is in good health, charming and charismatic, hospitable to his interviewers, and a humble artist. 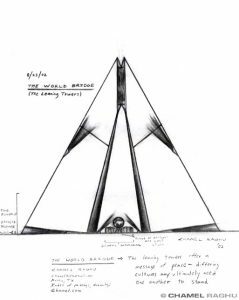 In 2002, Raghu submitted a sketch for the World Trade Center memorial, composed of a pyramid, and it was posted to the CNN website. However, the same figure was used for a war monument in Portugal. At first, he was appalled and upset that it was possibly taken from the website. Later, he realized there was a positive outcome. As for the “Rebirth of Asia,” Raghu began drawing the sketch about six years ago. It was the beginning of a more rewarding endeavor. Even though it was a challenge, the colors seem to be one of the best traits of the painting. They accent each point and edge on the dragon, having an aggressive and progressive aesthetic. Because of the coloring, the figure seems to pop out of the canvas therefore emphasizing the comeback of Eastern relevance. While color simplicity is one of his natural tendencies, he is not simple in terms of intellectual discourse. Raghu is half Indian and half Chinese, therefore already coming from an Eastern perspective. He believes that our global economy is now gearing toward the East, where Asian countries will have headway on technological and economic advancement. Perhaps this is why previous journalists called this creation, “the painting of the century” – a hype that was covered by Art World Austin. “The Rebirth of Asia” raises many questions, and while I am not an expert on global gross domestic product, recent reports do speculate that China is on the rise. I am also not a historical expert on art, so I would not be able to confirm that this is the “painting of the century,” but it definitely reflects the times and is historically significant in its own right. Raghu’s colleague, Tim Doyle, believes this painting represents an Anglism movement, where the points and angles represent a deeper meaning. Raghu confirmed that the forty-nine points in the painting symbolize the forty-nine countries in Asia. Of course, at the time of the drawing it was forty-nine, but now it is forty-eight. In an earlier article by MFA Digest, Michael Cohen mentioned Anglism is the first of three movements. What shall be the next two? 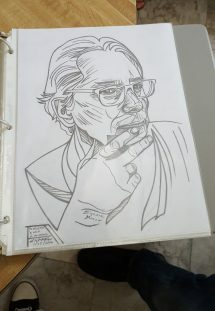 Aside from this venture, Raghu thoroughly enjoys his drawings and is thinking of selling them at some point. 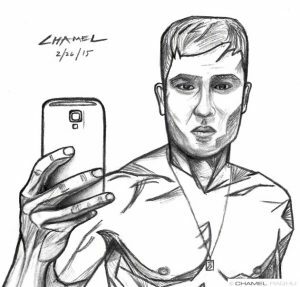 Still thriving on the simplicity of art, the drawings are a quick outlet of expression for him. As for complicated matters of society, he would like to represent those in his art and hopes that his audiences will see that. I read this article and found it very interesting, thought it might be something for you. The article is called Local Artist, Chamel Raghu, Creates “The Rebirth of Asia” and is located at https://www.austincurrent.com/local-artist-chamel-raghu-creates-the-rebirth-of-asia/.